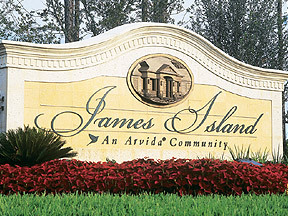 James Island community in Jacksonville, Florida. The graceful lifestyle at James Island revives the sense of an era gone by, where people stop and savor moments with friends and family. Set on 180 acres, this idyllic 365-home community by Arvida, a division of St. Joe Co., offers a variety of residential homes boasting lakefront and natural habitat views. Located south of J. Turner Butler Boulevard off Gate Parkway and Burnt Mill Road, James Island is the master-planned community with homes ranging from 1,800 square feet to 3,500 square feet. Residents enjoy a private, 24-hour manned security gate community in a pristine setting close to work, shopping, dining, entertainment, fine schools, the beaches, downtown sports complex and the new St. Johns Town Center. Amenities include a clubhouse, swimming pool, tot lot, basketball courts and athletic/soccer field.